Getting onto a cranberry farm can be hard. Get an exclusive look inside one of these farms to see what really goes on. Come fall it is easy to spot cranberry products in the grocery store. Cranberry juice, Craisins, cranberry sauce, and fresh cranberries claim a more prominent place in the store as Thanksgiving approaches. But have you ever wondered how we actually get those cranberries? 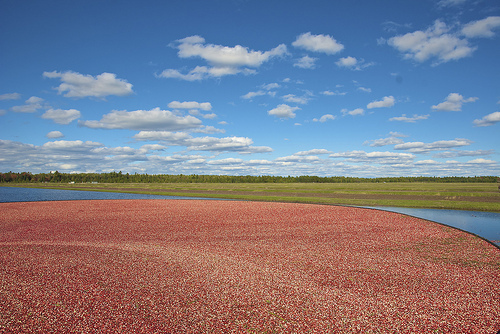 Compared to peaches, apples, raspberries, and strawberries, where u-pick farms abound, when was the last time you drove past a u-pick cranberry farm? If you’re like me, your only exposure to this seemingly top secret fruit was an Ocean Spray commercial that came out years ago where two goofy guys walked around in a pool of floating cranberries and performed various shenanigans. Based on those commercials alone, I always guessed that cranberries were actually grown in the water in someplace like Florida or California (though the trees in the background should have been a giveaway). After doing a little research, I quickly came to realize I was wrong. 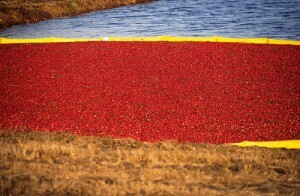 Cranberries do not grow in water, and they do not grow in California or Florida. Cranberries are one of three native plants to the northeast United States (blueberries and concord grapes being the others) and can only grow in a handful of states because of their unique growing needs. I was pleasantly surprised to learn that I am living in one of the top cranberry producing states in the country. So with visions of Ocean Spray commercials dancing in my head, I set out to find a cranberry farm in New Jersey that I could tour to learn more. It turns out that this is easier said than done because most cranberry farmers do not let anyone onto their farms. But this only added to my intrigue; why won’t they let people in? Were they trying to hide something? With a little persistence, I finally found my ticket into a farm called Pine Barren Native Fruits in Brown Mill, NJ only about a 45 minute drive from where I live. Instead of two goofy men in rubber waders waiting for me when I arrived, I was happy to meet Brenda, one of the owners of the farm, waiting to give the tour. Brenda and her husband both grew up on cranberry farms and this particular farm had been in her husband’s family for five generations. 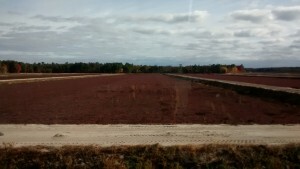 One of my first questions for Brenda was to figure out why it is so hard to visit a cranberry farm. In response to my question, Brenda explained that letting visitors on the farm is a huge liability. 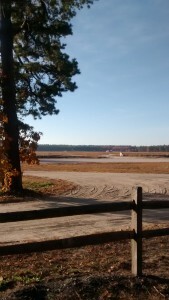 The nature of a cranberry bog requires strict sanitation policies, one dropped peanut could contaminate your entire crop. But even if liability weren’t an issue, Brenda explains, this type of career self-selects for people who like to be left alone or away from crowds. But Brenda isn’t taking any chances. No one is allowed to step foot onto the farm, instead she has me load into a small bus along with 10 other visitors and then drove us around to view the cranberry fields while making frequent stops to explain aspects or stories about her farm. The bogs, the official term for a cranberry field, look something like a sunken patchwork quilt with purple, green and blue rectangles lowered down a few feet below the ground and connected together by raised yellow sandy dams that are nine feet wide. Surrounding the fields are the rare Pygmy Pitch Pine trees that give the area its name. I happened to show up on a day they were wet-harvesting. Brenda explains that cranberries have air pockets that cause them to float. All the farmer needs to do is knock the berries off the vine and the cranberries will rise to the top of the water to be gathered. On the day I was visiting, Brenda’s son is doing that job. As he quietly moved along the water in what looked like a floating raft with a glass operating booth on top, a trail of red berries would rise to the top of the pool behind him. To gather the berries from the water, yellow tubing is connected to a tractor on each side of the bog so that the tubing floats across the entire length of the field. “It is the same kind of tubing they use to contain oil spills “ Brenda chuckles. The tractors then drive in unison down the full length of the bog pushing the berries to one central location. From there they are gathered into large trucks. Men in waders up to their chest walk into the water-filled bog with a rake to gather and push any berries that might have been missed. Now it was starting to look like an Ocean Spray commercial. When it is time to bring the berries to market most of these will be sold under the name of Ocean Spray. Only a few will be sold under the farm name. It turns out that Ocean Spray is a co-op of about 700 small farmers who decided it was in their self-interest to band together to sell their berries rather than to compete. So when you buy Ocean Spray products, you are in fact directly supporting small farms. During my visit to the farm, I was able to appreciate just how different cranberry farming is and why it would be difficult to open up these farms to large groups of people (though if they ever do, I will be the first in line to grab a pair of waders to gather my berries). As I got into my car to leave the bogs, I realized that there really wasn’t anything top secret about cranberries after all. This little berry just quietly goes about its role of being a truly American product, with a versatile taste. For some reason, that made me like them even more.